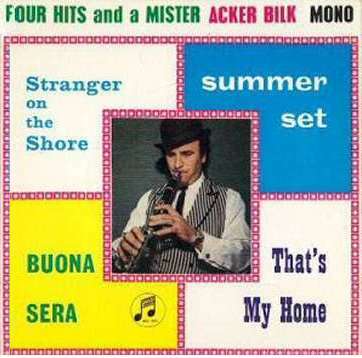 Acker Bilk taught himself to play the clarinet during his National Service, much of which he served in Egypt. Despite the deficiency of one finger which he lost in a childhood tobogganing accident- allegedly then eaten by a dog- he became an unusually skilled player within a few years. The Paramount Jazz Band were formed in the West Country and were little more than amateurs in Bristol when they were given their first chance to record. Traditional Jazz was slowly becoming popular when Acker and the band's piano player, Dave Collett, wrote the instrumental 'Summer Set'. This came at just the right time to pick up the public interest that Chris Barber had stimulated a few months earlier and the Paramount JazzBand were able to enjoy a string of singles hits throughout 1960 and 1961. It also led to a stream of releases by Pye of recordings that the band had made a year or so earlier. However, the record that was to make Acker Bilk internationally famous was not Jazz at all. It was a tune that he'd originally entitled 'Jenny' in honour of his baby daughter, but after its adoption as theme for a TV series it became known as 'Stranger On The Shore'. The record only reached #2 in the listings, although it easily outsold most of the #1s of the time for it remained in the UK chart for more than a year. Acker also recorded a version with lyrics sung by Michael London, an interesting variation but now hard to find on any medium.- (see Obscure Artists-M). The EP shown on the left (SEG8156) was the most successful of Acker's on that format to be released on the Columbia label. It contained all four of what were to be his only top 10 UK hits and therefore has to be looked upon as somewhat of a bargain. It portrays Acker in his trademark attire of bowler hat and striped waistcoat, possibly preparing to play his great masterpiece, "Stranger On The Shore". Jazz sometimes suffers from elitism and Acker was criticised for recording 'non-jazz' with strings. However, as he pointed out- those that go to his concerts to hear him play have to listen to Jazz. Traditional Jazz remained popular with 45-rpm buyers for only the first half of the 1960s though the bands that played it remained popular stage and club acts. Acker's unit was no different and remains on the Traditional Jazz scene, sometimes in the company of his former rivals- Ball and Barber, occasionally playing with veteran blues singer George Melly. He still plays his remarkable 'Stranger On The Shore'- the tune he now calls his 'old age pension'. Pye NJE1070 1958 "Mr. Acker Bilk Requests"
Travelling Blues/Delia Gone/Gladiola Rag/Willy the Weeper. Esquire EP213 1959 "Master Acker Bilk"
Melodisc EPM7-93 1960 "Mr. Acker Bilk & His Paramount Jazz Band Vol.1"
Melodisc EPM7-94 1960 "Mr. Acker Bilk & His Paramount Jazz Band Vol.2"
Melodisc EPM7-101 1960 "Mr. Acker Bilk & His Paramount Jazz Band Vol.3"
Melodisc EPM7-106 1961 "Acker Bilk"
Melodisc EPM7-116 1961? "Bob Wallis Meets Mr.Acker Bilk At The New Orleans Jam Session"
Columbia SEG8139 1962 "A Golden Treasury Of Bilk"
Columbia SEG8173 1962 "A Golden Treasury Of Bilk No.2"
New Orleans Stomp/Pretty Boy/Gatemouth Blues/Who Rolled That Stone Away? SEG8266 1963 "Four More Hits And A Mister"